Federated Community Church in Flagstaff, AZ, has cut its power bill 96 percent with a new solar array on their historic building. Solar power has slashed the cost of electricity at Federated Community Church, which meets in a beautiful century-old building in Flagstaff, Arizona. Now the congregation has a national award to show for its energy saving efforts, too. Federated Community Church is the winner of the Renewable Energy category in the 2012 Cool Congregations Challenge. 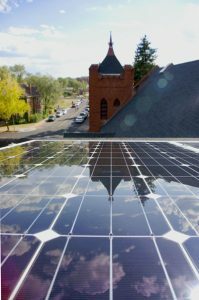 The church declared its energy independence on January 20, 2012, when the congregation raised a sparkling cider toast and powered up 132 new solar panels that now produce 96 percent of the church’s power. It was the congregation’s latest step in many efforts to save energy – and it was an easy step to take when the church board learned how it could pay for the solar energy out of its current budget. Church leaders realized that by installing the solar panels, they could save approximately $350,000 over the next 40 years. The monthly payment on a 20-year-loan would be roughly equivalent to the current electric bill, but over the life of the panels, the solar array will keep more than 2 million pounds of carbon dioxide out of the atmosphere. The church’s electric bills have fallen to just $45 a month – and only about $4 of each bill is for electric generation; the rest is for fixed costs like billing and metering. Congregants and the community can even track the solar array’s performance via a link on the church website at http://www.flagstafffederatedchurch.org/. Federated Community raised the $40,000 down payment from its congregants within a few months. Donors were invited to turn their sponsored panels into “time capsules” by including a personal message on aluminum tags that were attached to the back of the solar panels. These messages will be read many decades from now when the panels finally need to be replaced. Donors’ names were also included on a plaque on a large slab of polished juniper in the church community hall, which also includes a digital photo display to explain the project. Federated Community Church honors the past and saves money in the present with a project that respects the future. It’s a win-win-win for the congregation and for Creation.